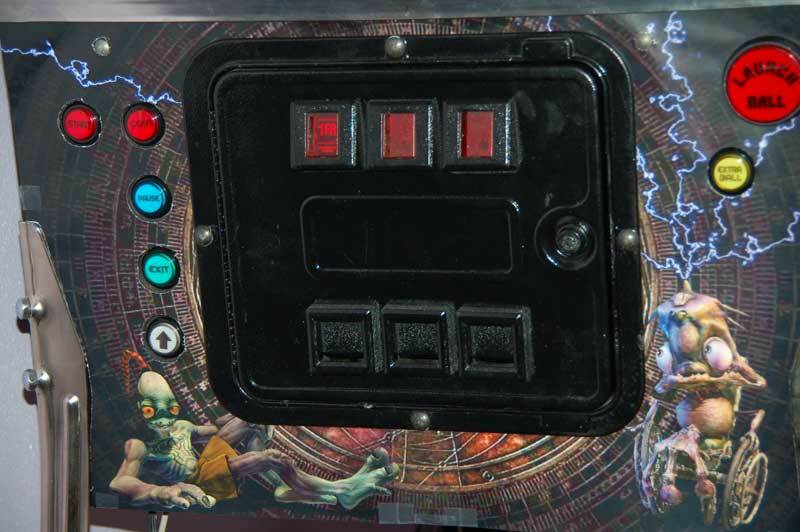 Some of you may have noticed that Shifters and myself have picked up the pinballs again this year. With the introduction of the Direct Output Framework (DOF) from SwissLizard some amazing things are possible that made us totaly rethink the whole concept we had on VP-Fx. The way we are working now is not based on hardware like ledwiz, boards to enhance the power and number off outputs but totaly focused on LEDstrips like the LPD8806 and WS2812. The driving of the strips is done from DOF via Artnet, a network based protocol. 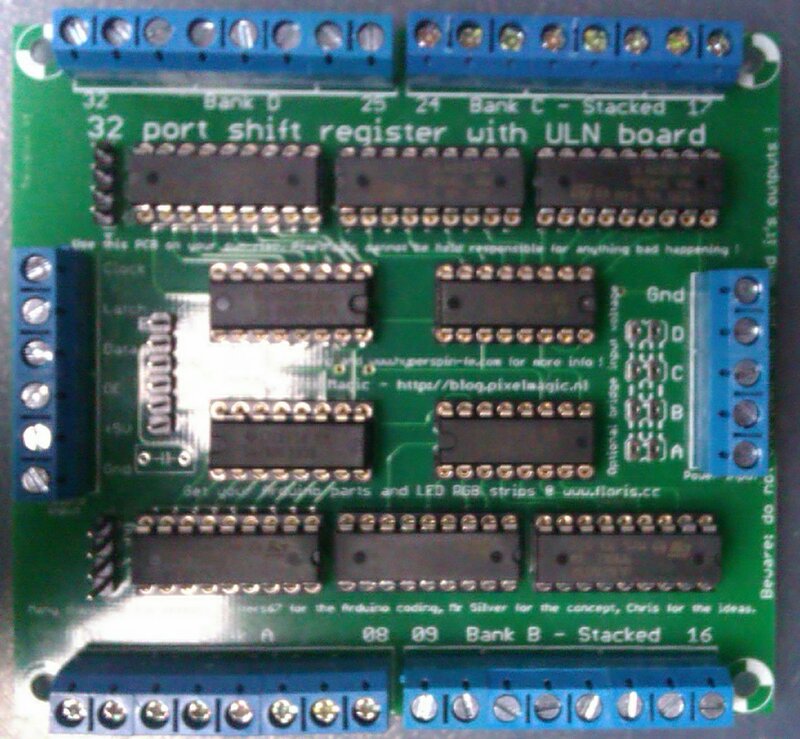 We connected an Arduino with a Ehternet shield to the network and Shifters made some very fast code to drive the strips. 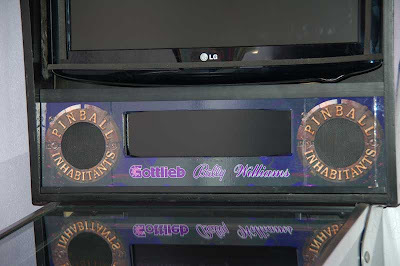 With Artnet you can have many differens Universes each having 512 channels. 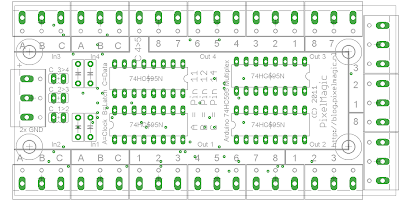 Those channels we use to drive the individual LEDs on the strips, where the first channel is LED #1, the red one, channel #2 is green on LED #1 and channel #3 is blue on LED #1. This way you can have a maximum of 512/3 = 170 leds in one Universe. The Arduino we use is a Mega, type 1280 or 2560. You will need a W5100 ethernet shield to get it to work with Artnet. Both can be bought on various placed like Floris or eBay. 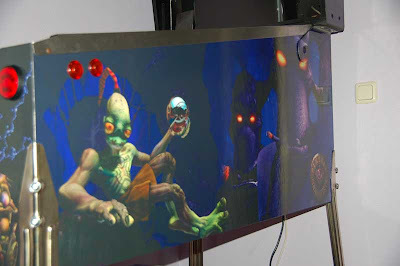 To get this to work you need software to translate the Artnet code to something the LEDstrips can understand. That will be available later on. The current software is capable of connecting up to four different ledstrip on one Arduino driving a maximum of 170 RGB leds. You might think, with a max off 170 leds on the Arduino with LEDstrips of 60 leds per meter, that is less then 3 meter I can have. Well, that is true, but making use off the different Universes and direct output on IP base you can have several universes each Arduino having its own. So when you have 10 Arduino's on 10 Universes you can drive 1700 LEDs. When you think you can place all off those let me know how that is gonna look, can't wait to see that ! 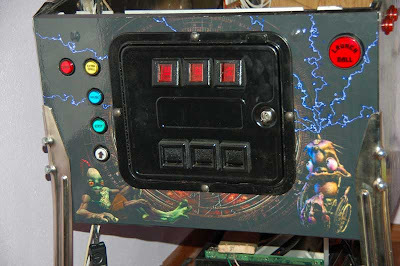 Ok, this is it for today, in the next posting I will get into the making of a cabinet.xml for DOF so you can drive your leds in a flexible way. 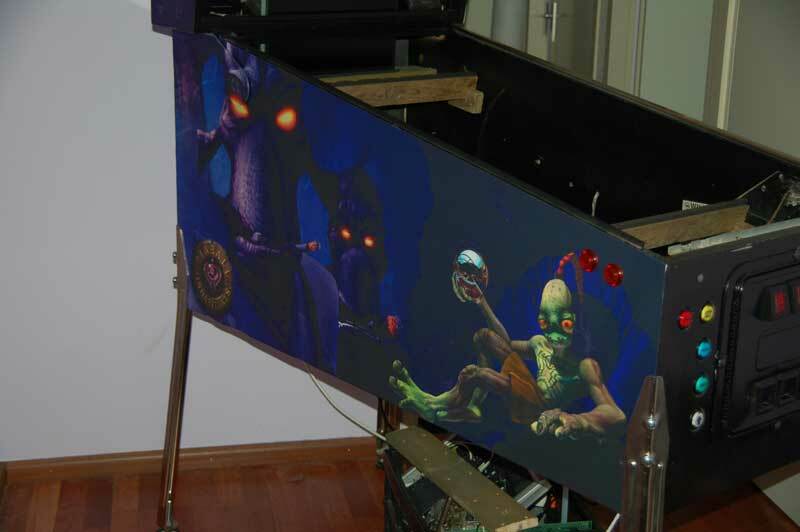 After a long break I am working on the pinball machine again. Coming back to the different forum sites I noticed some (a lot) messages that my LEDwiz utility is not working correctly in all situations. I was thinking on picking up where I left but discovered that some people have taken over the stick and made an amazing product that I very much support an reccomend for using instead of my old, half broken, tool. This great pleasure I would like to forward everyone to The DOF Configtool hosted on VPUniverse.com made bij Arngrim with (as I understand it correctly) help from DeeGor. I have put a notice on the LEW-Wiz page and with some time I will take the utility offline. 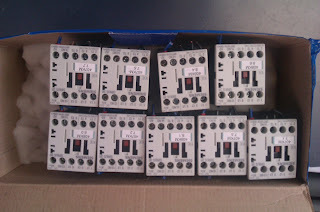 The new batch of pcb's for VP-Fx have arrived. 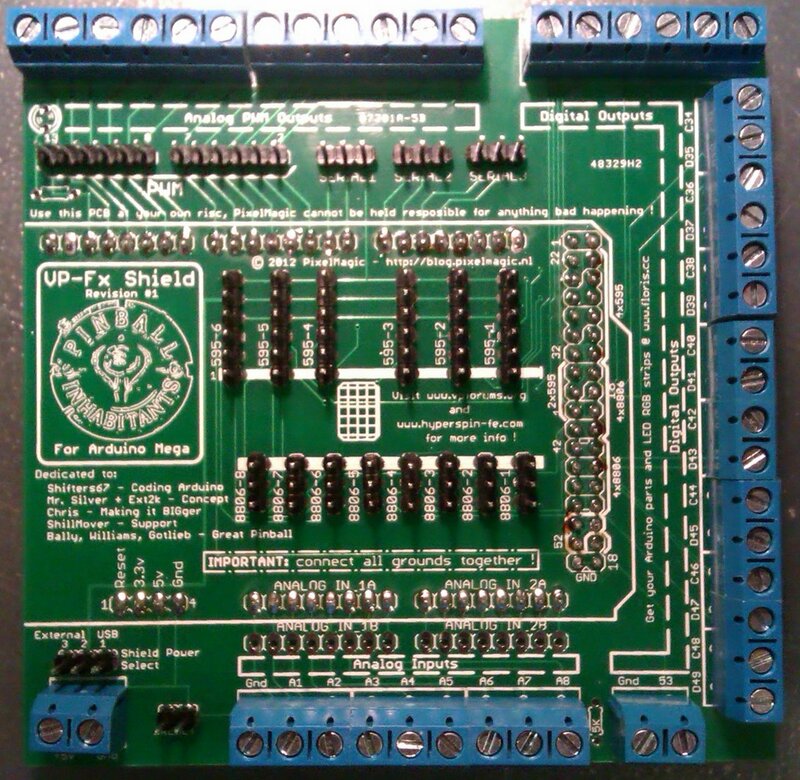 To give easy access to the Arduino Mega board i have designed a Shield that fits exactly on the Arduino, and has a load of screw connectors on it, and also headers to take a small flatcable from the shield to the additional Driver Board. 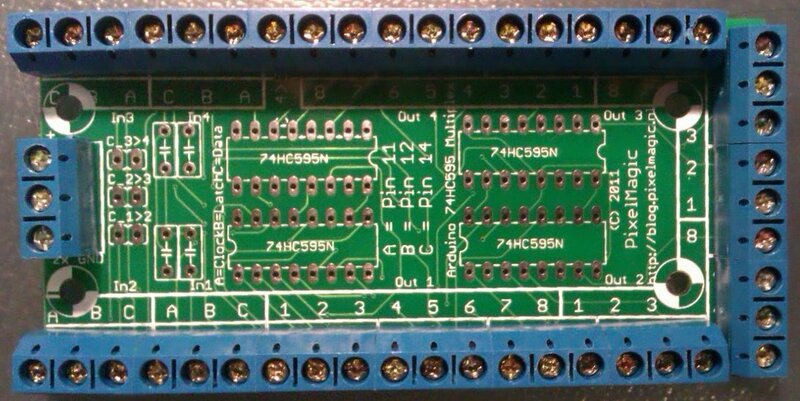 The vertical row of 6x6 pins is going to be used to transfer the signals from the Arduino to the Driver Board. 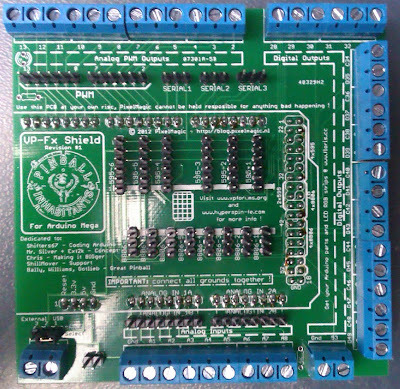 This new driver board get all needed signals via the flatcable (data lines and power) and uses only 3 outputs on the Arduino and transfers that 3 signals to 32 outputs. All conversion is done by the VP-Fx software and you can assign port numbers the way you like. 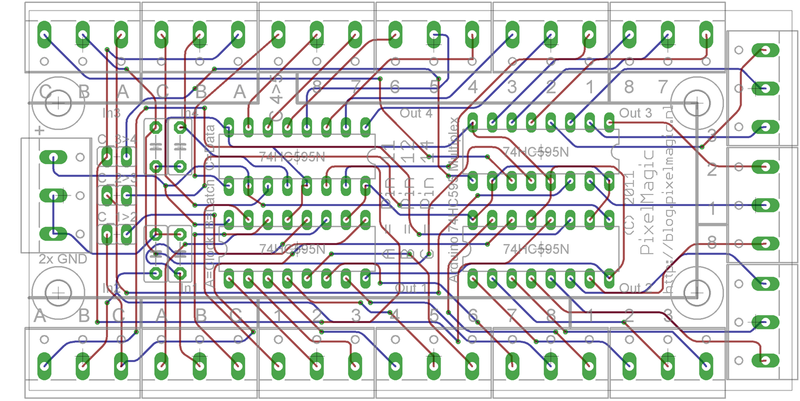 The board itself uses the same driver chips as the LED-Wiz does and gives you the same output power on 16 ports. 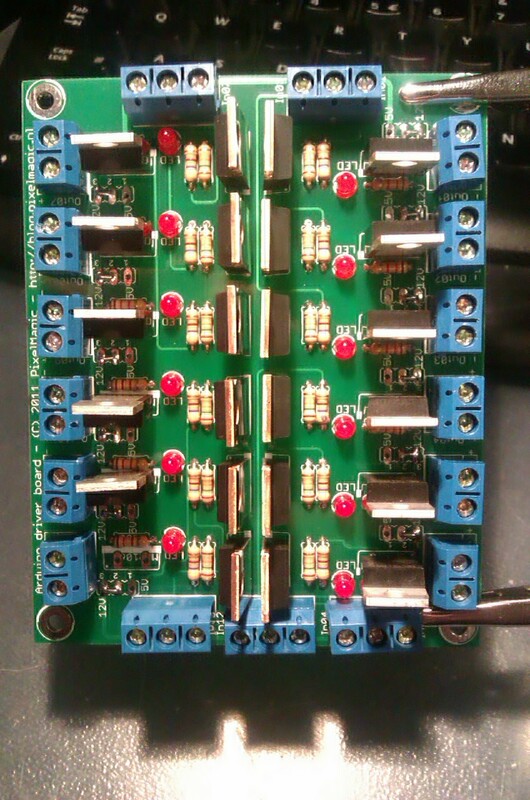 The other 16 ports have the driver chips doubled and give you in theory double the power that 1 ledwiz output does. 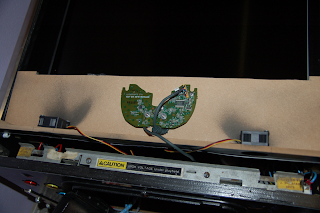 All driver chips have been placed on feet, so then IF you happen to blow out a output you can easy remove the defective driver chip and replace it by a new one. 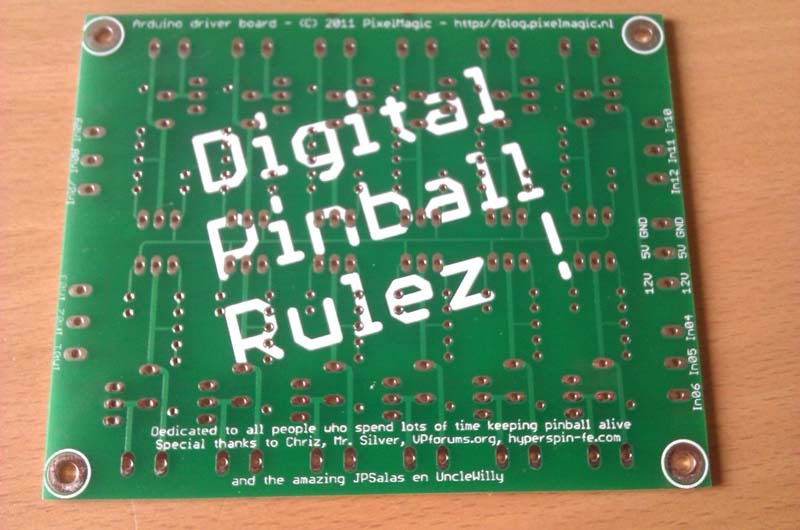 Both boards will be available shortly, only the pcb or fully soldered. Here is the latest video I made with the VP-Fx software and some custom configuration. 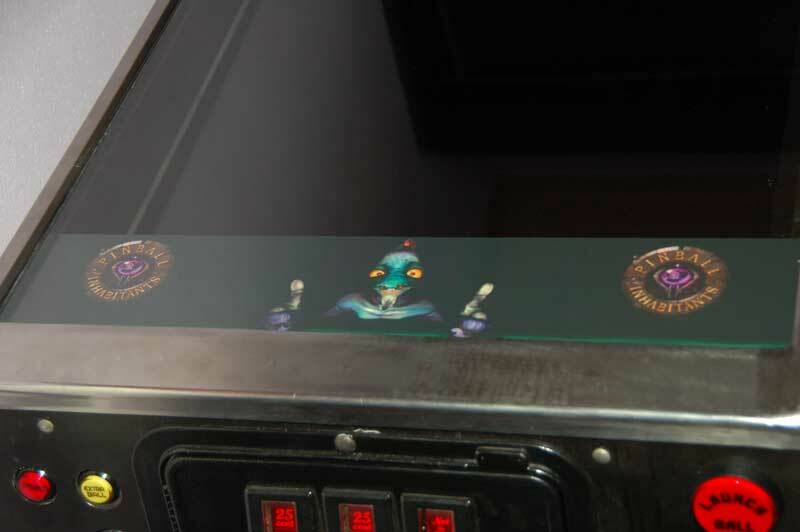 Notice the full-color LED's on the sides off the cab. There are 30 LED's on both sides off the cab, that can be driven individualy with VP-Fx. 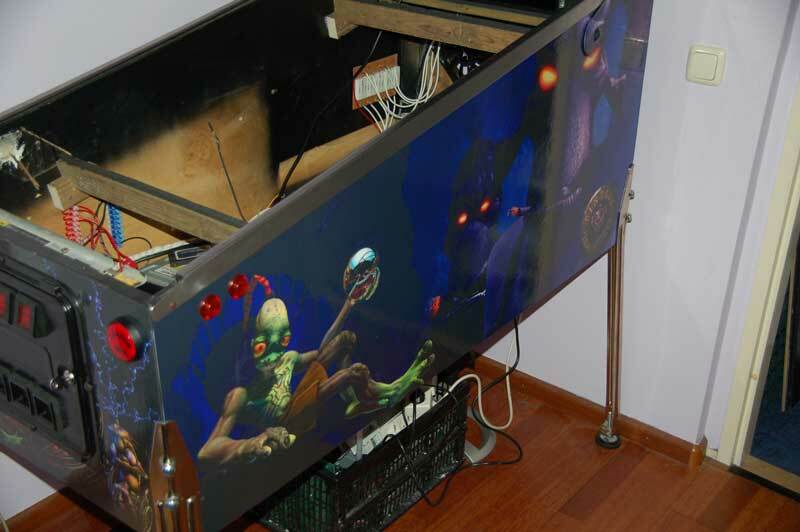 And remember, that 60 RGB LED's is not even close to the limit of the software. On LED-Wiz like config that 60 LED's would use 60*3=180 outputs !! 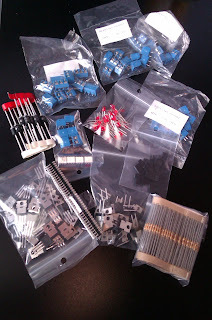 In the mean time, take a look at http://www.pieterfloris.nl/shop/ for some Arduino stuff you going to need. 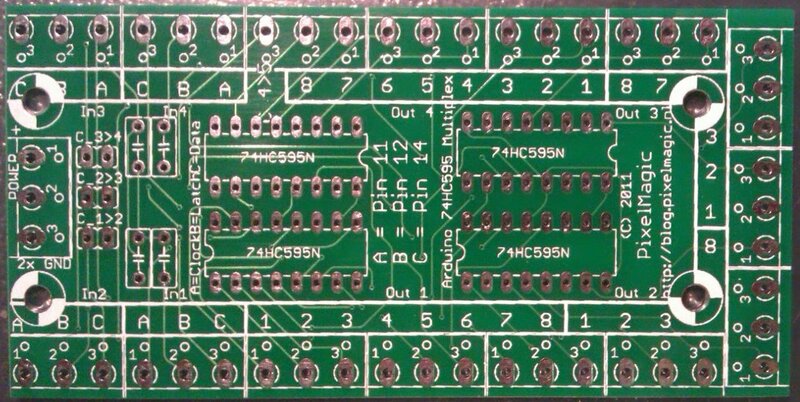 Here are some details off the multiplex board for Arduino i have made. 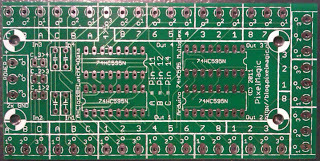 Beware: on the pcb the top left ABCABC if incorrectly printed as CBACBA. The above picture is the correct one !! Connect the Ground to the Arduino Ground and place a 5 volt supply with enough power to feed all of your connected devices. 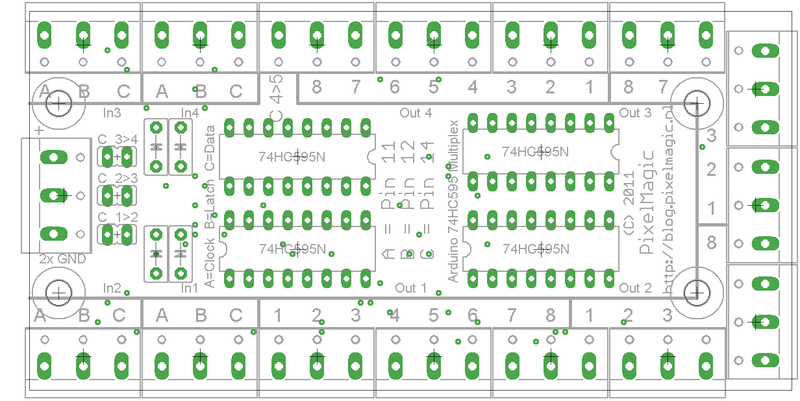 Connect the 3 pins from the Arduino to the desired 595 In1-4. If the 595's are placed in a row, place the jumpers in the needed positions and connect only the A+B wires from the first used port to the second, do not connect the C together, the jumper takes care of that. Make sure that the Arduino software knows that there are more then one 595 connected, otherwise you get strange results. The 595 can drive up to 20-30mA per output, not more. 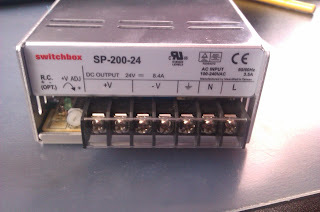 If you want to drive more power you need some kind of driver or relay. I have designed a PCB to use with the Arduino board so that you can drive more powerfull toys with the Arduino board. 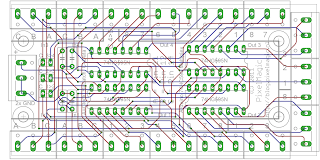 Each PCB has 12 inputs and 12 high power outputs that can be used separate from each other. 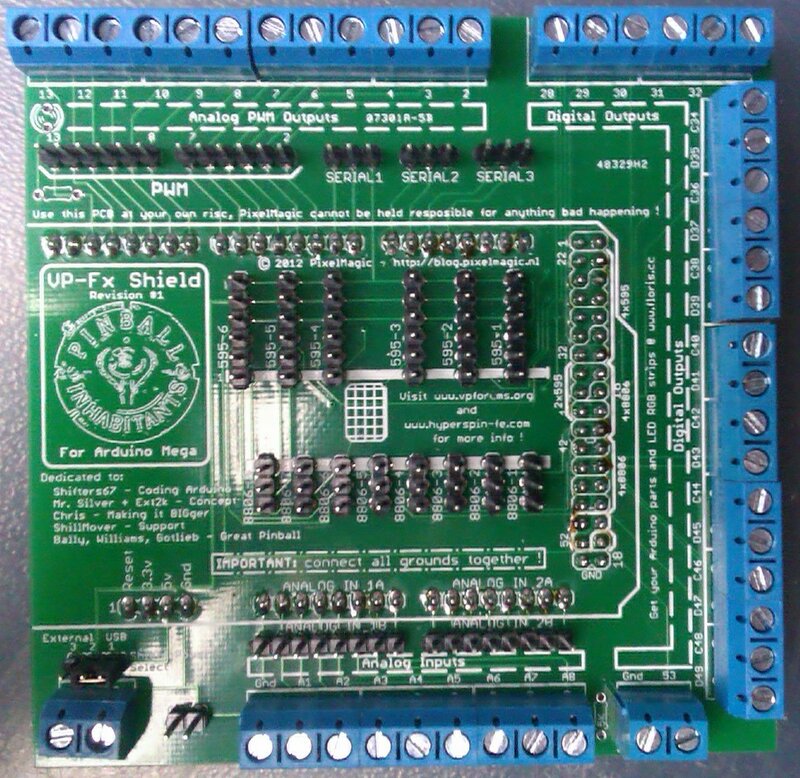 You can feed the PCB with 12 and 5 volts and via a jumper decide for every single output if you like to use 5 or 12 volt DC. The maximum output per port is user defined by changing the diode. 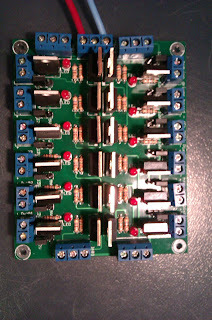 The default is max 16 amp with the MBR 1645 or you can downscale it with a other diode if you like. If you change the 560 Ohm resistor to 1K2 you can also use the PCB for 24 volts. The driver board will only switch on positive voltage, not negative like the LEDwiz. If you like you can invert the signal with an optocoupler (1N35 or so) and still use it with LEDwiz. 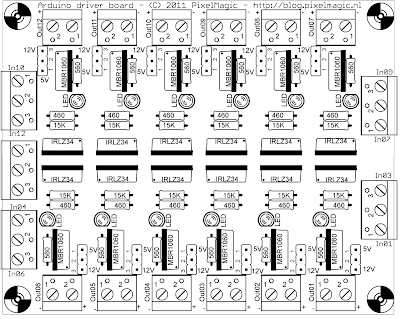 If there would be enough demand I could also design an PCB for that. 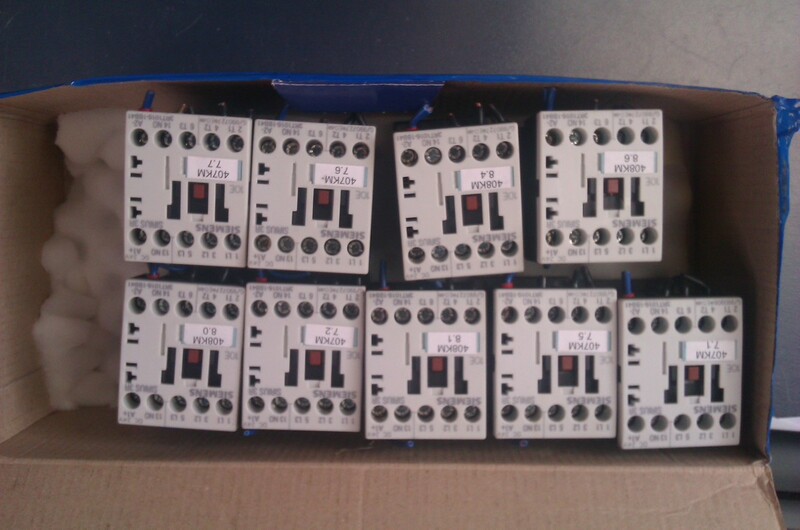 If you like you can order the PCB from me. 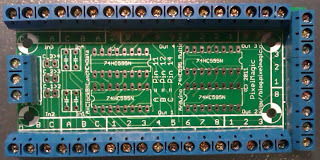 I also give the option to order the parts needed and final option is that i solder the board for you. Offcource this takes some time ! Important remark is that I do not do this to make money but just as a service to the community. But you also might understand that I don't want to lose money on it (ordering parts and let them collect dust) nor want to spend my valuable time for totaly free. 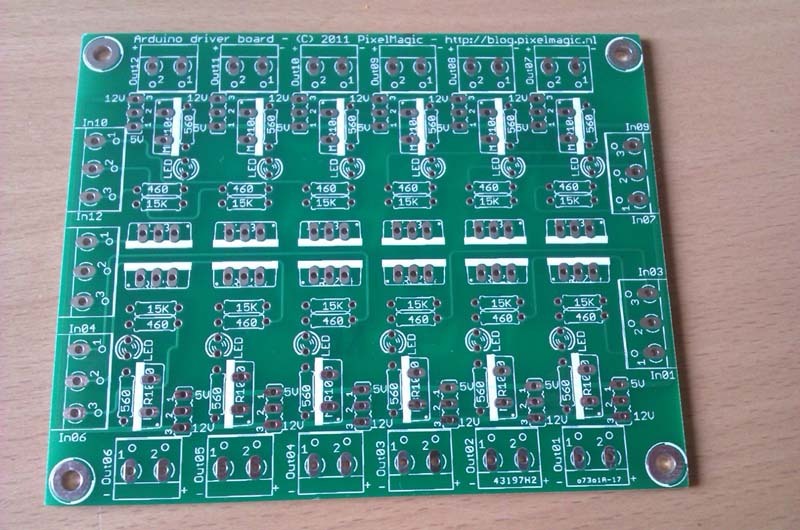 Having said that please understand that I do not offer next day delivery as I have to probably order the parts also and in some cases a new batch of pcb's. Contact me first on what the current status is of supply's. All prices excluding postage and packaging. Please contact me for current pricing on P&P. All packages will be send on your own risk. You get an email from me when it is posted. I will not be held responcible if things are damaged or lost. Payment is possible via PayPal or bank transfer (Europe only). If you like more info or order something please use the Blogger email function on the bottom left of this message (the M). Attention: the flat side of the LED is the Kathode ! 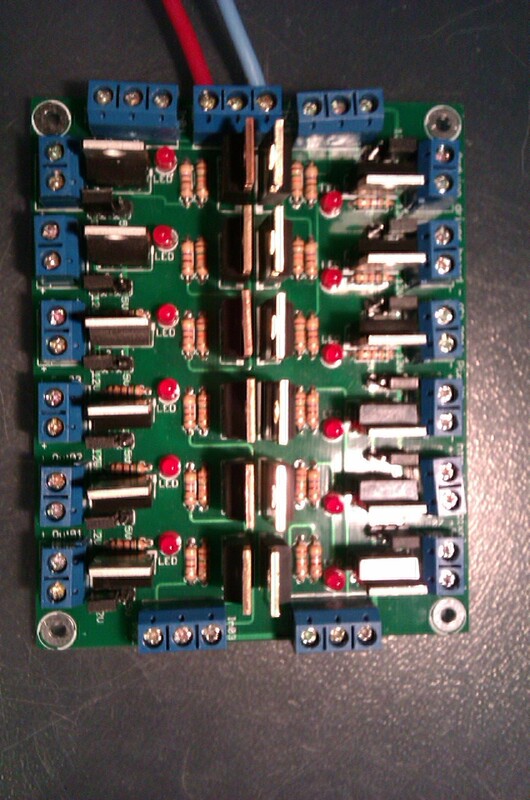 And the board works !! Next thing on the list is soldering some components for testing the whole thing and after that ordering the parts for 1-2 complete PCB's. 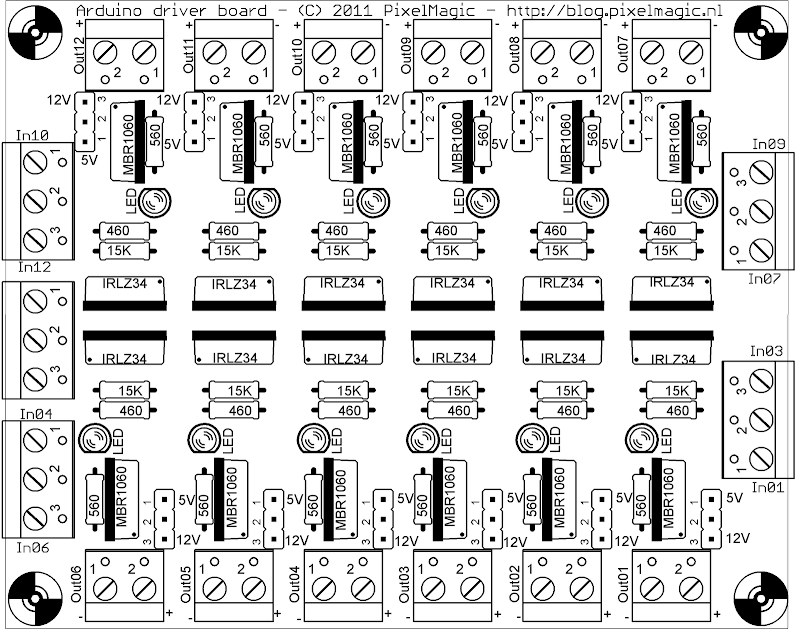 With this PCB it is possible to drive 12 devices from the Arduino, both digital and analog (PWM) and drive 5 and 12 volt devices by setting a jumper. Only 1 small flaw: the printing od the LED is not correct, the flat side must go on the other side. Beside that it is working, now need to order some more parts. Been busy with trying to make the Arduino drive all my toys for my Virtual Pinball machine. 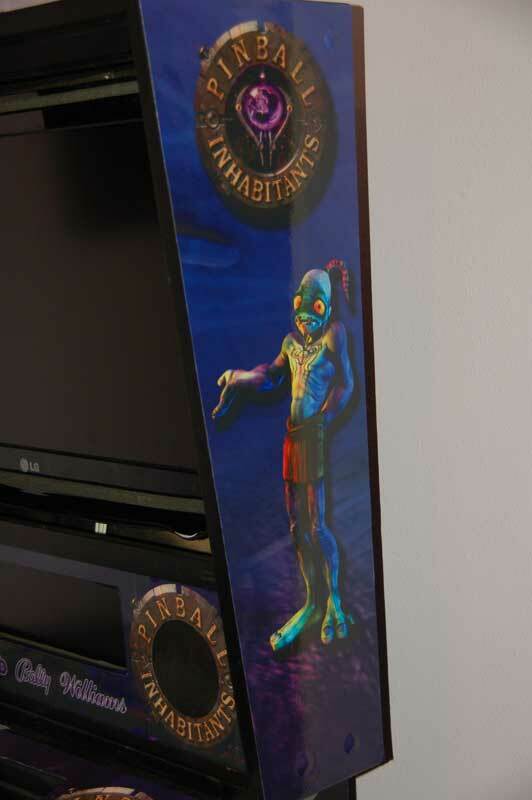 Today i made some big steps on the lighting of the eyes of the Mudokons on the bevel of my backbox LCD. I allready drilled the holes and today connected the wires to the arduino in a test. I got a MS Freestyle Pro joystick for nudging. 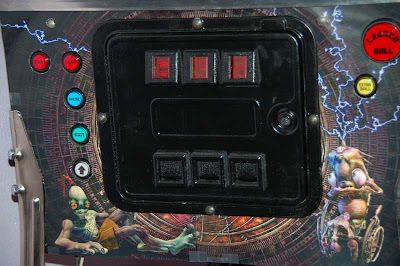 In my opinion this seemed like the way to go, directly on the place where you nudge (with your hands) and high in de cabinet so it can be as sensetive as needed. So i did. Then loaded MM and nudged a bit while in the shoot lane. And it worked !! Played a bit and noticed that if the ball was coming from the castle bridge down it was leaning to the left side. Did the calibration thing again after a default reset (mind the order !, forward as last) and played again. It works like charm !! BTW, mind the wire that comes from the Sidewinder, wrap it around something steady because if you let it hang from the PCB it will pull the PCB a bit away and gives you false readings. I added both sides and the front on the cab. Besides that the front and others are too small, tha dark colors just look really bad. The door is black, most of the backdrop is dark/black too. Does not show it. This was the paper printed with an laser. Much better i think. Yesterday the stickers arrived again, and sadly they are not perfect again. The size was not correct again, this thime it was cut to small on one side, so some parts are not wide enought (by about 10 mm). Also are the real black parts still not black, but more like a very dark green. Called the company today and i think we can agree on the sollution. The speaker area off the backbox, here you can see a bit of the dark area that not black. The apron, the large piece of this is black. Clearly you can see here it's not. Decided to leave my project website and transfer it to bloggspot. That's what you're looking at right now ! 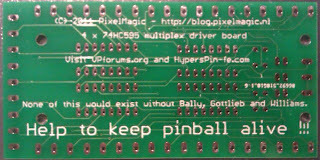 Added all info i posted at hyper(s)pin forum here and all the links and more. 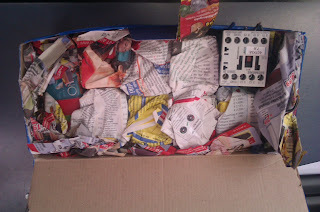 Ordered an second Arduino Mega 1280 for a very low price via Ebay on the 28th of february, got it today ! Got it from onlyforever702 from HongKong, very nice. Also got an email that my stickers are shipped, with some luck they will come tomorrow. First release off PixelMagic's LED-Wiz Default Configuration Utility (PDC). It is a web-based program where anyone can create and edit LED-Wiz tables settings. 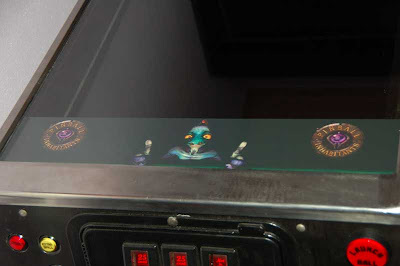 You can configure your own personal LED-Wiz connections with the hardware that you own and skip the ones you don't need. So when there is a new piece of hardware of a change of connections you don't need to edit the .ini file, you just drag and drop your new config, generate a ini file and place it in your cabinet. That's all ! I took Ext2k's config of 50+ tables and converted them to the default config (without flashers, PDC uses the new color system). After that a few form members (Chriz99, gStav, reko19, Njay) kindly added flasher config to a number of tables. There is a complete instruction on the first tab of the software, written by gStav. He also made a very nice how-to make a table configuration, including a complete step-by-step on setting the right values for a specific table. We kindly encourage you to enter more config's, the more the better ! And it's not so difficult with the manual. I would like to thank Chris and Gustav for the perfect help and suggestions on making this utility. Any additions or suggestions are welcome, please post them in this thread. Finaly some good news about my stickers ! It seems that in the converting from my .psd file the printer has made a mistake. So they used the wrong file format in the printing. Result: everything looked good to them (with the wrong file size as reference) but when compared to my original file it was way off. The will make me a third one, with confirmed sizes. Hop it's in by the beginning of next week. Keeping my fingers crossed on the result ! Good: Got 2Mb system memory from my best friend in the mail ! Good: Got my arduino in the mail ! Finaly got my resistors for the RGB leds, installed them yesterday, and WOW this is a cool effect !! Today got my stickers in, and a major dissapointment, the somehow blew up my image in size.